Marine Bodyworkz Ltd provide a professional application of antifoul. We can inspect and treat your hull as a single antifouling service or, as part of a more in-depth maintenance package. "The correct application of antifoul will slow down barnacle and algae growth preventing a drop in performance. Without regular maintenance a speed of up to 5 knots can be lost in the speed of a powerboat, resulting in a hike in fuel consumption of almost a third." Antifoul is a commercial underwater hull paint. It’s a specialised coating applied as the outer layer to the hull of a boat or ship. To slow the growth and/or facilitate detachment of subaquatic organisms that can affect performance and durability. When applied correctly, is one component of a multi-layer coating system acting as a barrier against corrosion and improving the flow of water past the hull. The performance and maximum speed of a boat decreases as it’s hull becomes fouled with marine growth. Antifoul must be professionally applied and once dry, tiny fibres stick out from the coating surface. These fibres move in the water delaying bottom growth from adhering. Some marine growth, such as shipworms bore into the hull causing severe damage over time. 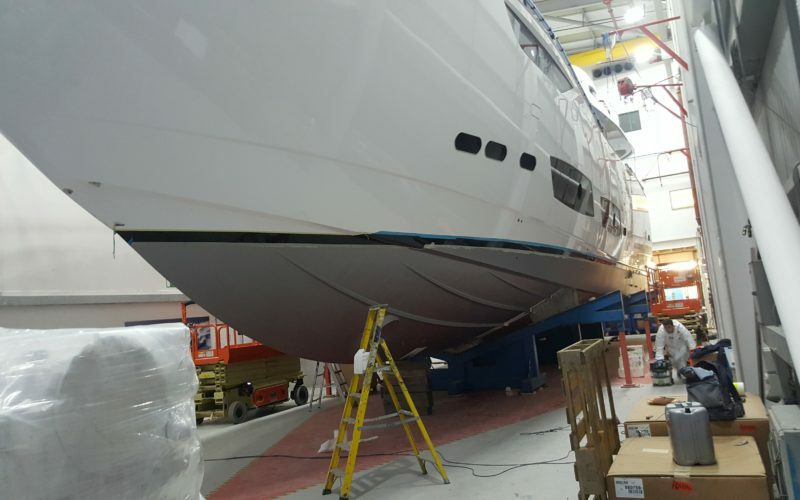 How often does my boat need antifouling……..? When used and kept on the water for prolonged periods, an annual inspection is recommended. For boats used less frequently and kept in dry dock, antifouling application is recommended every other year.